Today’s post is sponsored by Land O’Lakes – we ♡ their European Style Super Premium Butter with all the heart-eyed emojis. Is it just me or is chicken starting to be awesome again? Through the last few years, Pinch of Yum aka my-personal-self went through a phase of chicken rebellion. I was doing things like creating meals with plant-based things like MUSHROOMS or NUTS or TOFU. Okay waaaait I still really love mushrooms and nuts and tofu and I am definitely still a part-time vegetarian with a deep love for the whole plant-based thing. Exhibit A. But somewhere between the garlic and basil // the lemon and capers // the gold standard of BUTTER: me and chicken are back in business over here. Oh, chicken piccata, you beauty, you. Now, I say all that about chicken but now I’m going to go and tell you the truth. The truth is that it’s not chicken that makes this amazing – it’s the combo of flavors in the sauce. P.S. Welcome to my sauce blog. Food? That’s nice. But SAUCE? I can’t even. I need all of the sauces, ever. This has been a slow fade over the last five years, but I think we can officially say we’re there. New job title: Sauce Blogger. When you simmer a white wine reduction with tangy lemon slices and salty chicken broth, good things are going to happen. Good as in magical. Good as in why are you still reading this post. W-H-Y. But friends, you don’t stop there. No. You are are hungry for the mouth-puckering brine of the capers, aren’t you? I just knew it. You and I jive with this whole sauce blogging thing. So the important next step is that you you get extra-generous and you throw the whole darn jar of those little green-ish poppers up in the mix. I’m literally puckering my mouth right now as I imagine how salty-tangy it is. Right? RIGHT? Oh my gosh, it’s so good. And that’s exactly what you do. This whole sauce wouldn’t be complete without the gold standard of creamy and luscious – LAND O LAKES® European Style Super Premium Butter. That velvety finish to your sauce takes it to the NEXT LEVEL, man. Speaking of levels. Grilled bread is on the scene and we’re going to Level 500 now. If this recipe is about the sauce, then this recipe is really about the bread, because you just fry that bread up in a little olive oil and butter (or grill, if it’s summery where you live because it will look cooler with grill marks, but I live in Minnesota where it’s already cold and dark by 6pm and so I “grill” in a skillet, okay? don’t be mad) and then you dunk said buttery golden brown bread into the leftover sauce. 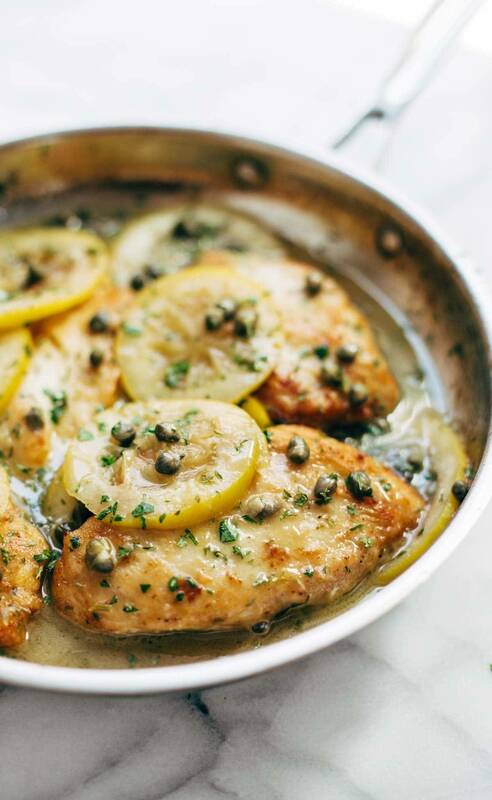 Chicken Piccata – you won’t believe how easy this recipe is! Perfect with a green salad and grilled bread for soaking up all the extra sauce. Cut the chicken breasts in half so that you have a total of four pieces. Cover with plastic wrap and pound them to an even thickness of about 1/2 inch or less. Place the flour in a bowl with some salt and pepper. Dredge the chicken in the flour mixture and set aside. Heat 2 tablespoons of butter and the olive oil in a heavy skillet. Add the chicken and fry for a few minutes, flipping once. Both sides should be golden brown. Remove chicken and set aside. Add the wine to the skillet and let it get all sizzly so you can scrape browned bits off the bottom. Add the broth and lemon slices. Let the mixture reduce to half or less. Add the capers, butter, and any remaining juice you can get out of the lemon nubs. Arrange the chicken pieces back in the pan and sprinkle with fresh parsley. VOILA! For the “grilled bread,” you have a few options. You could brush a few pieces of sliced baguette or country loaf with butter and actually grill it on a grill or toast it in the oven. But my FAVORITE is sort of a grill/fry situation – heat a thin layer of oil AND butter together in a heavy skillet and add a few pieces of bread to each side, flipping once until both sides are golden brown and heavenly. Drain on paper towels, and now use the crispy golden brown bread to sop up that briny sauce. Ugh, I’m drooling. It’s so, so good. Pinch of Yum has partnered with Land O’Lakes for an exclusive endorsement of LAND O LAKES® European Style Super Premium Butter. This post is sponsored by Land O’Lakes. So I’ve never had a caper (I’m ashamed) but I love everything else about this chicken dish. It sounds almost identical to chicken Francaise, which I love! Maybe it’s time I go buy a jar of capers? Anything with chicken, lemon, butter or capers makes me very, very happy. So obviously I’m rather excited to try this! That is some beautiful chicken. Ha! I go through chicken phases too. This recipe looks like it would be a winner in my house. YUM! Awesome! Hope you like it, Chelsea! This looks delicious! I love chicken piccata, but piccata with grilled bread sounds like heaven! 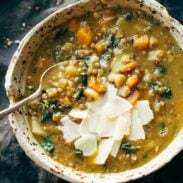 Gorgeous pictures and recipe! I am practically salivating. Sopping up that buttery goodness with that bread…heavenly! I follow your blog for the plant based food but I am determined to make this sauce with something vegetarian because it looks so amazing! Any suggestions? Im gonna try it with Tofu..Give it a try if u like tofu..
Hi, Laura! I think this sauce has various vegetarian options that would go well… Tofu, tempeh, fried eggplant, fried zucchini, or just mixed vegetables! I think it’s hard to make chicken look beautiful, but you’ve mastered it! These photos are stunning! I can just imagine the aroma of that sauce–looks amazing! Hope you like it, Sue! Yum, yum, yum! I want to make this, but I lack confidence frying the chicken. Can you give more info on how hot the pan should be and how many minutes on each side- or a tip on how you know when the chicken is perfect? Thanks so much! It really depends on your burner and how powerful it is, also how thick the chicken breast is, and what type of pan you’re using. I find nonstick cookware to be a little more forgiving when it comes to chicken. In general, 4-5 minutes per side should be plenty. Sounds pretty simple to prepare and looks so yummy! Looks great. If you are going to add butter, this is one of those dishes that the butter really makes it. You do know that sometimes I just come here for the drool worthy photos, right? Oh yum! Try using chicken thighs…so much more flavor, and they don’t dry out as much! Chicken Piccata is so underrated. It’s my go-to at Itallian restaurants. Hope you like this one, Libby! You are terrific! I am so excited that I found your blog through bloglovin. Now I’ll be following all your recipes! Thank you!